I got what you are saying, thanks. Funny the two were off, at least off enough to give me the "something ain't right heeby-jeebies". Where do you get all this background? Ouija board to Matt Jeffries or something? I often see that type of stuff too... working so closely on the details of both models often means I need to take extra care not to mix and match them. But yeah, that is a great eye for details! Just tons of research over the years. Oddly enough, that type of background info wasn't what I was looking for originally. I was trying to gather as much information about the models as I could... but the models were continually changing, so it became necessary to build a timeline of events. Pretty soon those events I was gathering data on started giving me information about the artists involved as much as the models they were making. You can find an early version of that timeline (from 2010) here... and I've gathered a ton more information since then. That was how I found out that Roddenberry didn't get the 33 inch Enterprise at the end of TOS (which he wasn't even part of by that point), but when he returned to Paramount and started working towards a new Trek series. And it is how I finally found out that the Enterprise's final mission (that it never returned from) was to Robert Abel and Associates as a reference for TMP. And that the team at Robert Abel and Associates (headed by Richard Taylor) believed that it was a model made for Phase II and considered it worthless. After TMP was finished (Robert Abel and Associates had been replaced during TMP production by Douglas Trumbull's team) Roddenberry called Bob Abel asking for the model back and Abel said they no longer had it. None of that helps with the details of the model itself, but it is nice to finally know the true fate of the first model of the Enterprise. 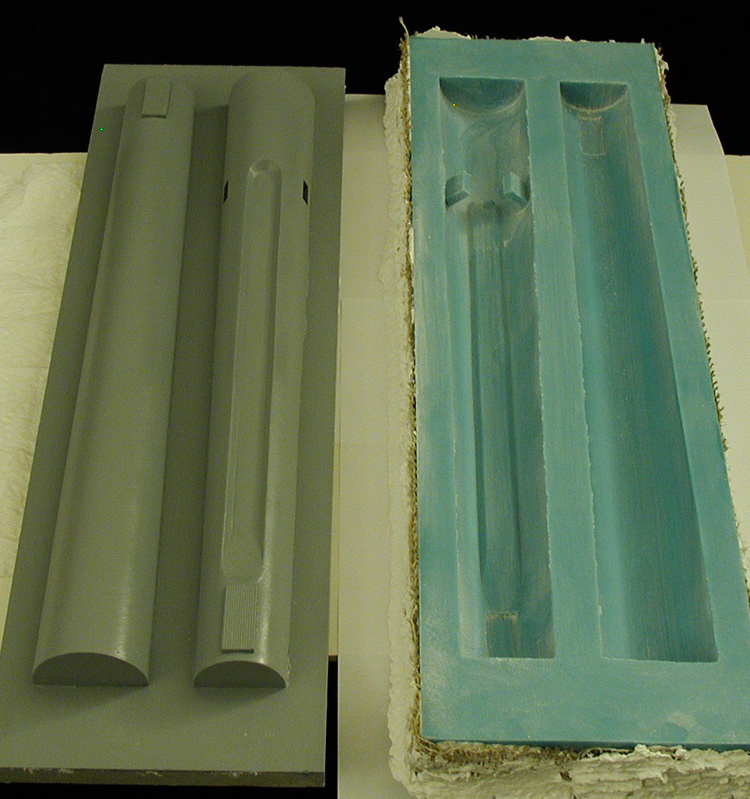 Finished making the mold for the nacelle body. It'll be a while before I get a chance to actually use them, but so far they look pretty good. All the angles look pretty good at this stage. And if there had been nacelles on the pylons, their center lines would have been about 10 inches apart (like they are supposed to be)... so that is a sizable amount of work done early on while engineering the masters that has thankfully paid off. And I decided I really wanted to see it with the primary hull in place too... so here it is. 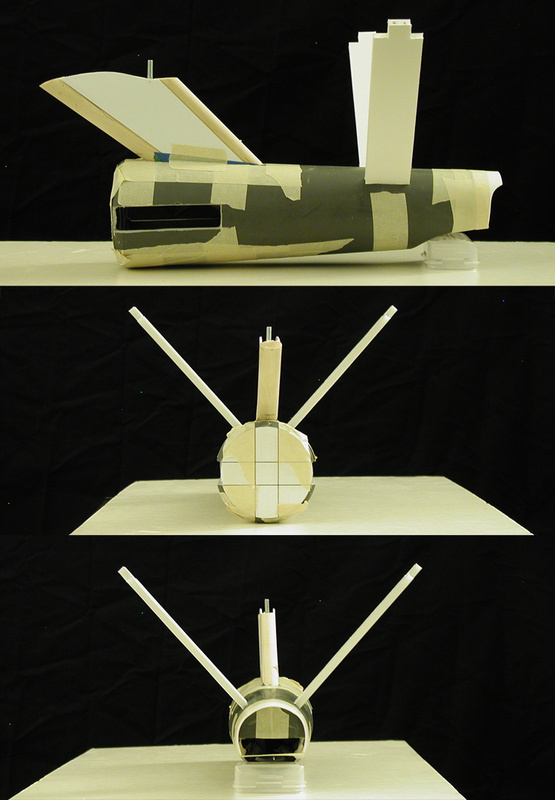 This is a test assembly with a test pull from the nacelle molds... mainly to see what was involved in making them. Last night I was experimenting with the nacelle body molds to see if I might like Alumilite White better than the TC 1630, and how little material I can get away with (the first nacelle body was about 8 oz). I made a second test nacelle using about 4 oz of Alumilite, but I like the TC 1630 better for this type of part (though I think I can get it down to around 4 oz of material on the final nacelles). Even though I didn't want to waste any more time on the Alumilite nacelle, it is a second nacelle... which means I can take some more test assembly shots that can help me judge if I'm going in the right direction with this model (I had made additional changes to my plans after the second study model, so this is really my first chance to see them). Over the last few days I've constructed the nacelle support pylons. They are actually pretty strong (stronger than I thought they'd be), and can support the weight of either test nacelle. Still, I'd like to get the weight of the final nacelle bodies down a bit more because there are a number of pieces which will eventually be added... adding weight to the nacelles. And even though most of them should be pretty light weight, the domes (which were finished a while ago) are solid and do have a bit of weight to them. It is still pretty rough, but right now I'm mainly happy that all the major elements at least play nicely with each other. I made another nacelle and tested it against the first nacelle I made... it weighed in at about 90% the weight of the first one, which isn't the significant reduction I was hoping for. Considering that there are a number of additional parts that are going to be added to the nacelles (and assuming that they are all the same weight for each nacelle), we are really looking at something closer to a 5% difference between the first and second tries using TC-1630. Given that, I'll use that first test pull as one of my nacelle bodies as there isn't a good reason to waste more material if I'm not going to make a significant improvement over what I already have. And now that I know that these are the final parts, I'll start in on bringing them together to make the nacelles. I took a few more shots of the model with the new nacelle body, I'll be pulling it apart to start doing some more significant work on the secondary hull and dorsal next. In these images I've included the Viewmaster shots of the original model (which I believe predates the accident that damaged the model). There has been a number of people who have asked about how I'm building these parts. I'm finding that a lot of people are assuming that because these are open faced molds that I just fill them to the rim with resin and end up with solid parts. I avoid making solid parts if at all possible, usually only small parts are cast solid. In the case of the TC-1630, I get about a 10 minute window of work time, so I spread a thin layer over the surface of the mold... making sure to brush it up towards the edges and the higher points. Pretty soon it starts to thicken, and when it stops easily flowing, I let it sit for a couple minutes. I then press in pre-cut sheets of fiberglass cloth, making sure it conforms to the interior contours (it has some give, and you can pre trim it to lay pretty flat against the mold's surface). I then mix up a second batch of TC-1630 and brush it over the fiberglass... making sure it gets absorbed into the material before it starts to set up. Once I get a good covering, I start brushing it up towards the edges like before. 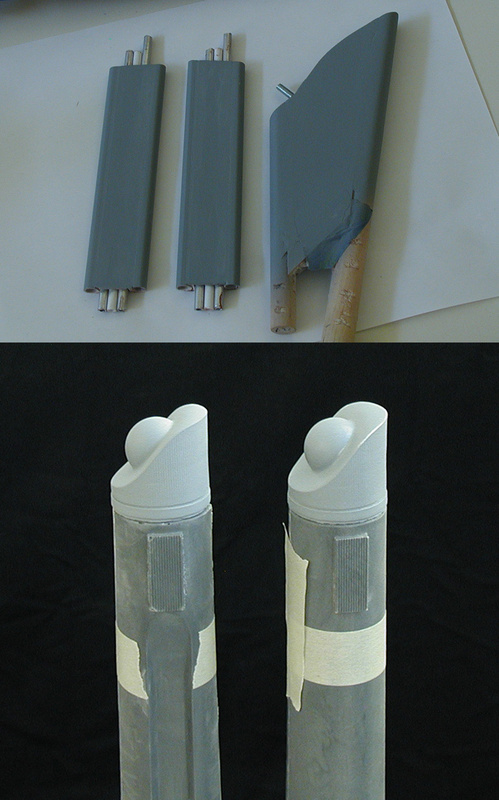 The parts can be removed from the mold pretty quickly... though I usually give it a few hours. After six to eight hours it is pretty hard, after 24 hours it is rock solid (pretty much no-give)... which is why it works so nicely for these larger parts while letting the parts stay pretty thin. 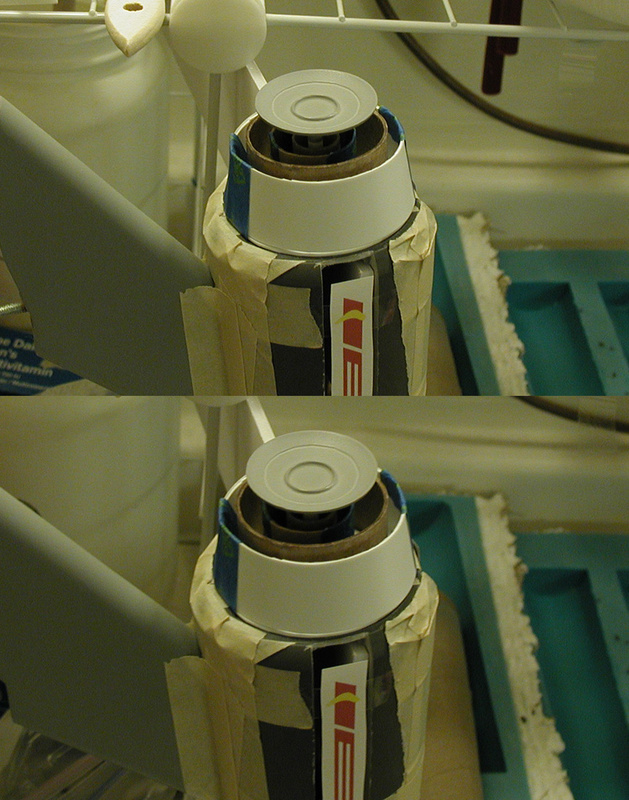 The irregular surface on the interior of the nacelle is from the brushing up process. Irregular surfaces are actually stronger (more rigid) than smooth ones, so it acts sorta like a structural re-enforcement. The TC-1630 actually cuts nicely too... this is why I wasn't too worried about leaving off key details on the secondary hull master so I could get away with a single master and mold to make both sides. Knowing what I was going to be working with ahead of time is why I knew I only needed one secondary hull half, one outboard nacelle body half and one inboard nacelle body half to build the secondary hull and nacelles. I figured I'd share this with you guys anyways in case anyone was curious. I do let the fiberglass go up past the edges of the mold... but the molds aren't the correct size anyways, so trimming is actually part of the design. I made all the masters with a margin of error edge, so they need to be cut down to be the right size to bring them together. Almost none of my parts are design to just fit together, I build them to be adjusted later when I'm bringing them together. This is why nothing I build is designed to be kit friendly, none of it actually fits together from the molds... nor was any of it intended to. I really couldn't imagine handing off any of the parts I make to someone else and expecting them to build a model from them... they are just way too far from being finished parts at the time I make molds compared to how kit parts are made. To deal with the fiberglass that isn't encased in the material, I go over the loose edges with CA to keep it from becoming more of a mess when trimming. I finally cast the rear end caps and have been slowly working on the dorsal and nacelle support pylons. Once I have the front nacelle parts made I'll actually start in on assembling the nacelle bodies themselves and cleaning up the imperfections. Here again I had built in a margin for error into the nacelle body design so that I could fit the ends to the more detailed nacelle parts... so there isn't much I can do to the nacelle bodies until I have those parts ready to go. I've been working on a number of different parts of the model recently, mostly the deflector assembly, casting parts for the nacelles and making sure I'm happy with the dorsal and nacelle support pylons. I've also been working on the decals, so I've placed test printings of different decals on the model to compare what I have against photos of the original model. I did a quick test assembly to compare some of the decal elements. 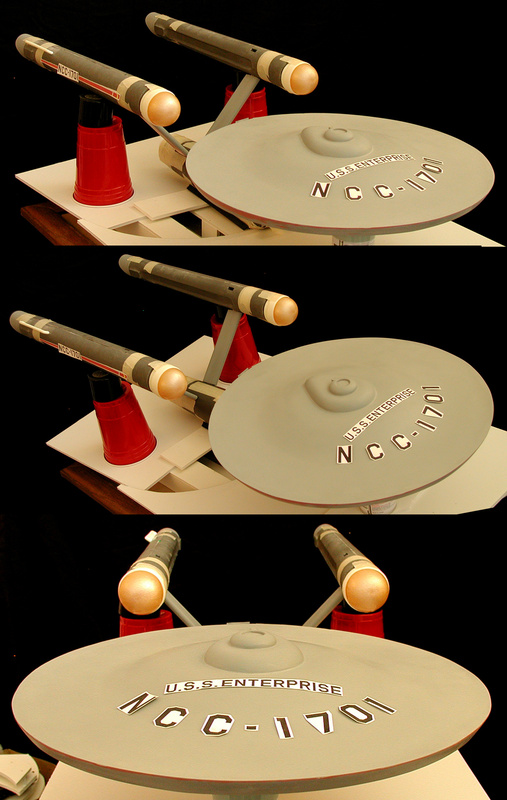 Oddly, while the original builders of the model took the "U.S.S. ENTERPRISE" straight off the decal sheet, the smaller "NCC-1701" decals have had their spacing adjusted when they were applied to the original model. I realized after taking these shots of the deflector assembly parts that I had used the templates based on my original (2007) plans and not the updated ones... so the second of the three inner rings is too wide. This is another couple shots of the deflector assembly with the start of a new second ring and the deflector dish master in place. With a few more of the nacelle parts cast, I took another series of shots of the model assembled to see how things are coming together. One of the things I noticed about the secondary hull pennant on the original model is that the rear slopes downward (on both sides) compared to the center line of the secondary hull and the windows. I'll have to figure out how to replicate that without taking it too far as to be noticeable (which on the original it is hard to spot). How are you mastering the body of revolution parts like the deflector dish? 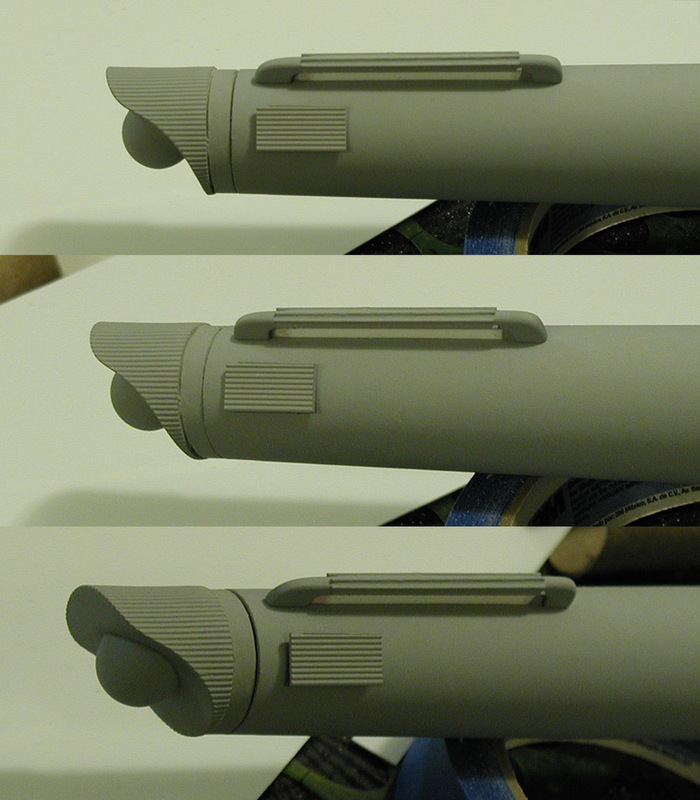 And, the nacelle end caps. The ball part on the 11 footer seemed to protrude in such a way that the recurve back in was perceptible. Was the 33" done differently? It was hand sculpted using Aves Apoxie Sculpt... basically a lot of work over a long time. Other attempts using other methods didn't turn out as nice. The sad thing is that I have to do essentially the same thing all over again for my one-sixth scale 11 foot model... which still needs an accurate dish. The end caps are different between the two models... almost everything is different, which is why there wouldn't ever be an easy way to convert a 1/350 Enterprise into an accurate replica (at 96% the size) of the original studio model. Those parts were built based on my plans of the 11 foot model based on my research and reverse engineering from my reference photo collection (so no one else's work was referenced for those plans). All of those contours were arrived at using the same techniques I've used to make my plans of the 33 inch Enterprise (only I have to work with a smaller collection of reference photos for the 33 inch model compared to the 11 foot model). Originally both models were built in less than a month, so while they have a lot of elements in common... nearly all of them have subtle differences. 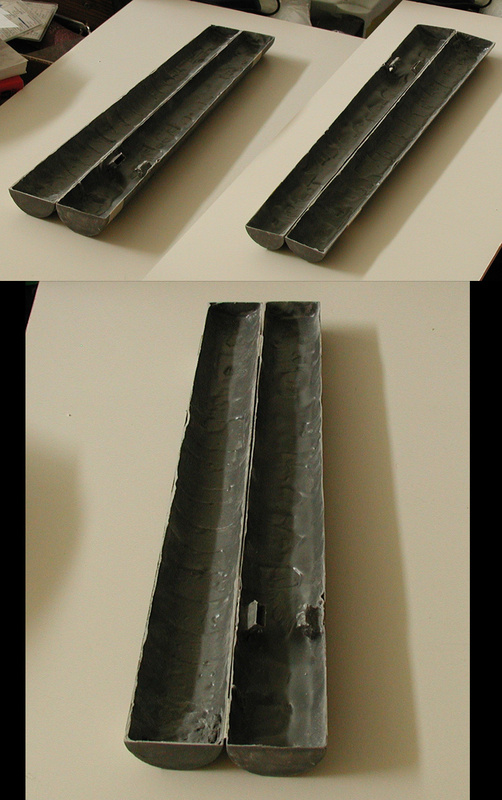 When the 11 foot model was finished being modified for the series, the 33 inch model was modified to reflect similar changes, but even those weren't exactly the same. This is also why it is best for me not to work on both the 33 inch and 11 foot models at the same time... it doesn't take much to accidentally apply details from one model to the other when doing my research. Of course, the primary reason for translating my 11 foot plans into a model is because the same research techniques were used on those plans as on my 33 inch Enterprise plans, and if that model is an accurate representation of the 11 foot Enterprise (which most people are familiar with) then maybe they'll realize just how accurate my 33 inch Enterprise model is (even if they aren't as familiar with that version). I though the ball droop (that does not sound right) was indeed different. You lost me a bit there...the PL 1/350 is based on the 11 footer, right? You want to build a 22" version of the 11' miniature? To help show your 33" 1:1 model is accurate? And how many spare bedrooms do you have dedicated to this fleet?! You lost me a bit there...the PL 1/350 is based on the 11 footer, right? You want to build a 22" version of the 11' miniature? Yeah. The main reason for the scale (which is about 1/500) is that it isn't close to either 1/1000 or 1/350, so it can't be mistaken as a kit build of either of those models. Also, building either of those (even if I make changes) would still be building a Gary Kerr Enterprise rather than a David Shaw Enterprise. The only thing I've gotten directly from Kerr is a handful of measurements (I trust his ability to take and record measurements), but everything else is based on my analysis of the model from my image collection (which also includes shots of parts laid out next to rules for additional reference measurements). Plus I've been mainly focusing on the 11 foot model as a model rather than the idealized/fictional starship. Of course part of the reason for my study of models as models (and sets as sets and props as props) is to make sure I stay safely in the range of the fair use part of US copyright laws (this is academic research, and avoiding the fictional universe which CBS controls). It is also why I use a Creative Commons Attribution-NonCommercial-ShareAlike license on my drawings. To help show your 33" 1:1 model is accurate? Well, yeah. And not just for the 33 inch model, but also for my Phase II Enterprise as well. For example, I know that Randy Cooper is a great model builder. The quality of both his models and kits is outstanding... all of which can be seen by visual inspection. But what about accuracy? I don't know many of his modeling subjects well enough to tell if he has made accurate models... except the Galileo. I know the Galileo and I know that his model is not accurate (it is quite stylized) compared to either the studio model or large scale mockup. So now I wonder if the same is true of his other models. So even if my 33 inch Enterprise or Phase II Enterprise look nice, there aren't enough people truly familiar with either to say how accurate they are. 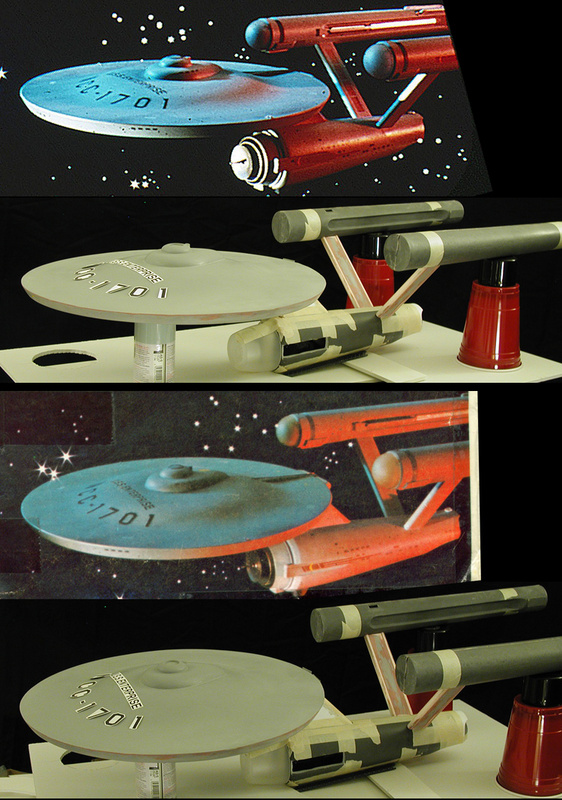 But if (using all the same techniques) I scratch build an accurate model based on the 11 foot Enterprise (which a lot of people are familiar with), then it would be easier to assume that those other subjects are also accurate representations. And how many spare bedrooms do you have dedicated to this fleet?! Aw... the space issue. I have a deal with my wife that I put up for sale a model as I finish one. I put the Phase II Enterprise up for sale (though I'm not in a big hurry to sell it) and just put the Galileo up for sale. 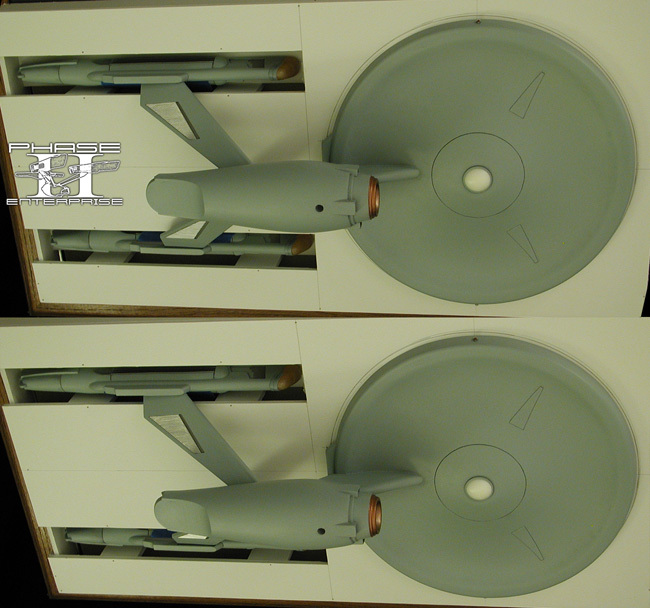 I'm putting serious thought into retrofitting my second two-thirds scale study model of the 33 inch Enterprise with better details and putting that one up for sale (as I don't need multiple versions of the same subject) when I finish this one-to-one scale version. Over the last 8 years I've made 7 models, so I'm not very prolific. The down side of that is that it also means I don't get much practice either. 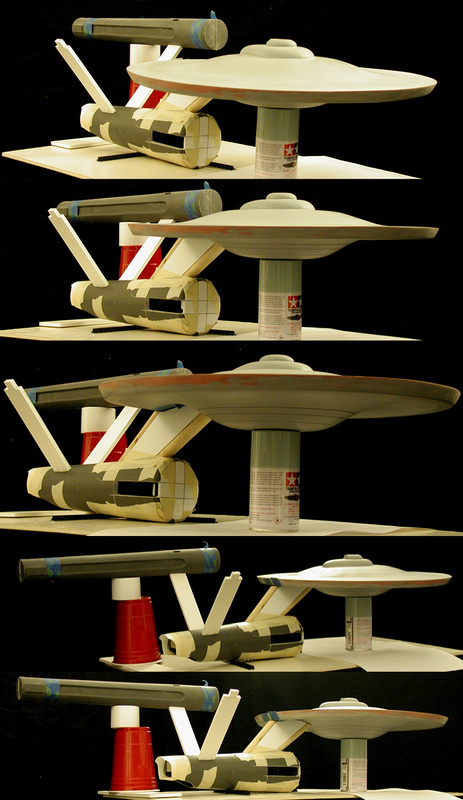 One of the things I noticed is that the nacelles seem better balanced with the dome assembly elements in place. This will help me make sure that the nacelles align with the primary hull, which is done via the secondary hull. The nacelles only need to be partly assembled and the primary hull is mostly assembled for these parts to correctly align the dorsal and nacelle support pylons in the secondary hull as I bring it together. Thanks again for the detailed discussion. So, this begs the question: which version of the Enterprise to you represents the Enterprise Starship? Which one has Kirk, Spock and McCoy in your mind? Considering how many versions were on TV, between 3 main versions, the AMT kit and the 33", there's a bunch to choose from.